Before I share a few simple ideas with you, I want to first state that I believe that the best possible way for kids to learn about new cultures is to experience them through travel and hands-on learning IN other countries. Not everyone is able (or wants) to travel to new countries with their preschoolers and toddlers, so finding simple and fun ways to expose them to new cultures within your community and home is your next best option. The definition of culture can vary. In this post I am simply talking about culture with regards to exposing kids to simple details about a specific country and people other than their own "home" country. Toddlers and preschoolers are very self-focused, so my recommendation when teaching children about new cultures is to focus on aspects of that culture that would be interesting to them. As they grow, you can then emphasize more complex aspects of the culture that you think are important to know about. 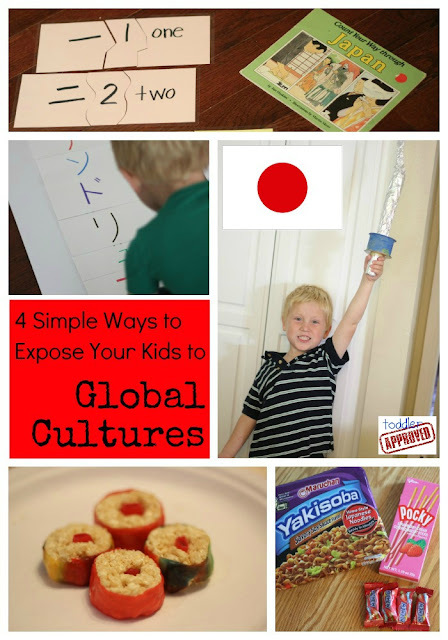 Today I am sharing 4 Simple Ways to Expose Your Kids to Global Cultures without leaving your home. I will demonstrate how we followed these tips this past week as we focused on learning about a country that I love... Japan. I lived in Tokyo, Japan for several years when I was in middle school and loved it. I love the Japanese people, language, and culture and hope to be able to take my kids back to Japan someday. In the meantime... I decided to share a little bit about the Japanese culture with my kids this past week. The Olympics always motivates me to have a more global perspective and look outward. 1. Read simple children's stories that take place in the country and do a book-related craft or activity. 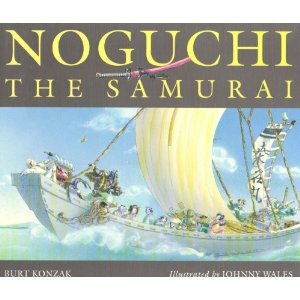 Noguchi the Samurai by Burt Konsak is a book that I have read with elementary students again and again. It has beautiful illustrations and a very simple plot that teaches about bullying and how to out-wit a bully instead of fighting one. It takes places on a ferry boat on the coast of Japan. The book provided a great forum for me to talk with my preschooler about how to treat people who are unkind to us and to use our minds and words instead of weapons and our bodies. 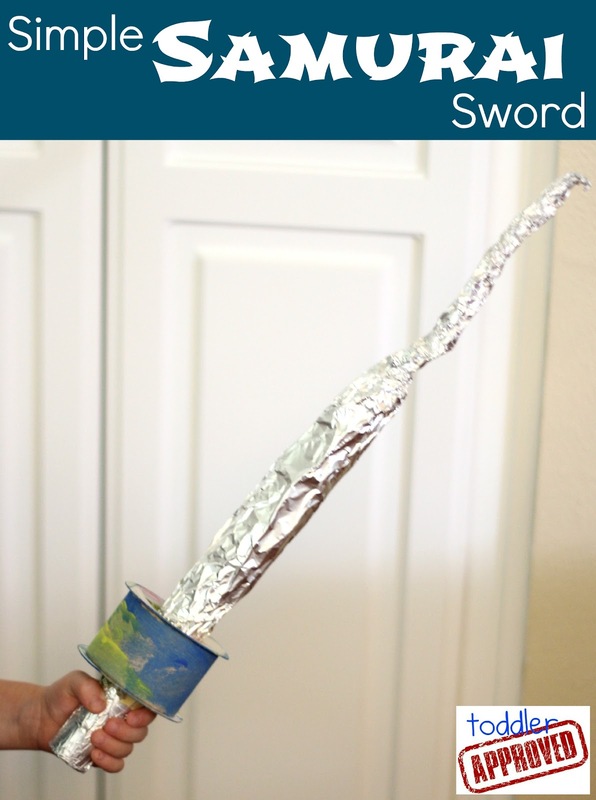 After we read this book, we made a simple samurai sword with aluminum foil, a paper towel roll, paint, and a cardboard ribbon spool. All we did was wrap the foil around and around the cardboard roll and added some extra at the top to make the sword longer. 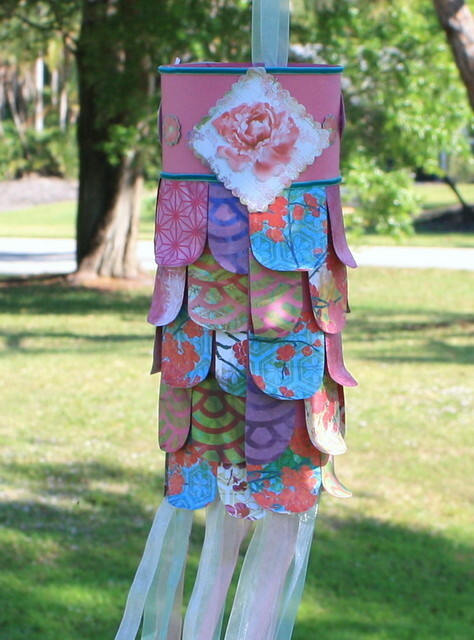 Then we painted a cardboard ribbon spool and cut slits on the inside so that we could gently pull the sword through it. My son carried his sword around with him all day long. Shibumi and the Kitemaker by Mercer Mayer is another gorgeous book. The illustrations portray very traditional Japanese images of cherry blossoms, cranes, kimonos, lanterns, etc. The story is about a young princess who is sad that the people are so poor in her city. She decides to fly on a large kite up into the sky and stay there until her father, the Emperor, makes things better for the people. The book is very different than Mayer's familiar Little Critter books and we love the details and simple story. The book is longer than many picture books, so I summarized the story in some spots to hold my preschoolers attention. Toddlers may just enjoy looking at the pictures and talking about them. 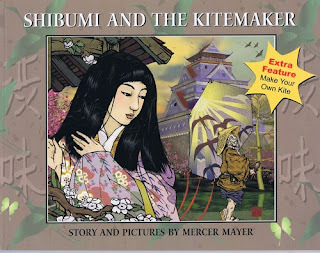 We ran out of time this week, but if you have the opportunity to make a kite after you read this book, here is a beautiful one that we wanted to try. 2. 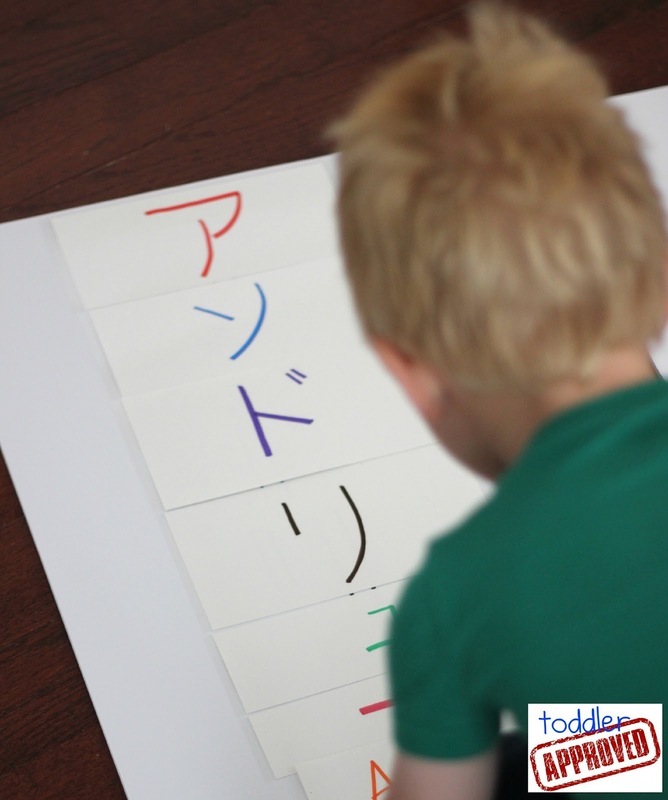 Teach your child to say and write their name in the new language. I made a simple puzzle with my son's name written in Japanese. I laminated it so that it would be sturdy and we could use it for awhile. He had fun putting it together and moving the characters into the correct sequence. Once we put the puzzle together, we practiced saying his name and writing it. We also listened to the computer say his name in Japanese using Google translate and he thought it was hysterical. 3. Try a new dish or favorite treat from the country you are learning about. I bought several of my favorite Japanese treats to share with my kids. I love Hi-Chew and Pocky, so we tried a lot of that. I also introduced them to yakisoba which is just a simple noodle dish. I didn't make it from scratch, but just bought a package where you just add water. I lived on that stuff when I was in Japan and like it. One of these days I'll actually take the kids to a Japanese restaurant so that they can experience the real deal. 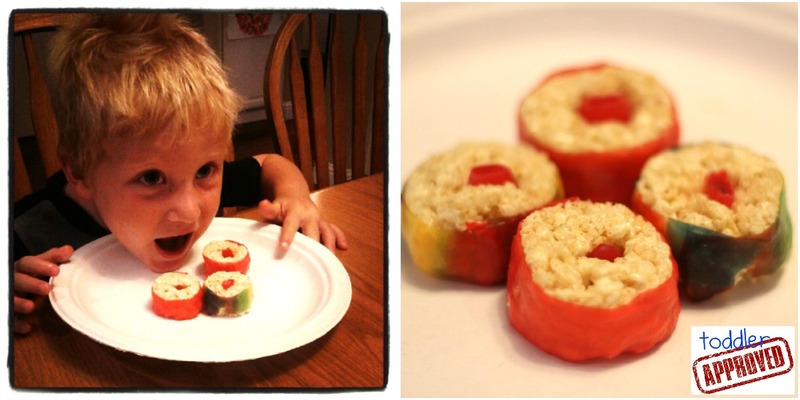 We also made some rice crispy and fruit roll up sushi. There are tutorials all over Pinterest that show how to make the sushi... my little guy LOVED it. I am not a fan of real sushi (though know how to make it and have tried it several times), so I thought this was a fun way to talk about it and not actually have to eat it. 4. Learn to count to ten in the new language. 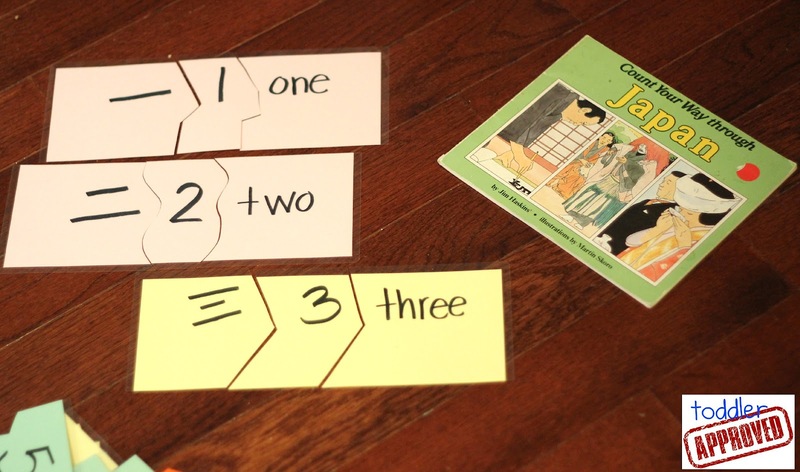 I made some simple number puzzles after we read the book Count Your Way Through Japan by James Haskins. We had fun putting the puzzles together while we talked about the little things we learned in the book about Japan. I love it because it shares very interesting facts about Japan as you learn how to count to ten. My son's favorite things were hearing about Mt. Fuji and earthquakes. There are a few cultural inaccuracies in the book, but overall it is a great way to simply teach young children about Japan and counting. What country would you like to teach your child more about (other than your "home" country)? How else do you expose your young children to global cultures in simple ways? This week we also had fun reading Mandy and Pandy Visit China and Mandy and Pandy Say "Ni Hao Ma? ", both free ebooks available as part of the Memetales 2012 Readathon. This week's theme was focused on learning about Global Cultures. We learned a little bit about the Chinese language along with our study of Japan. Since both countries are very different, yet have some similarities, it was interesting to talk about them a bit. I love your number matching activities!